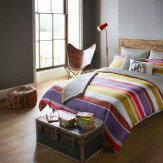 A fresh new horizontal stripe bedding collection in a rich mix of aubergine, chartreuse, sky blue, denim, truffle and garnet on the front, with an allover broken stripe on the reverse. 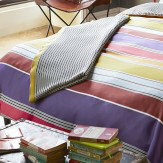 Printed on luxurious, 200-thread count, 100% cotton sateen. The collection also includes a geometric design knitted throw and cushion, and a decorative charcoal grey elephant motif boudoir cushion on a linen ground.